Michael McFadyen's Scuba Diving - Tathra Wharf The Far South Coast has a couple of dive sites that are unique within New South Wales. 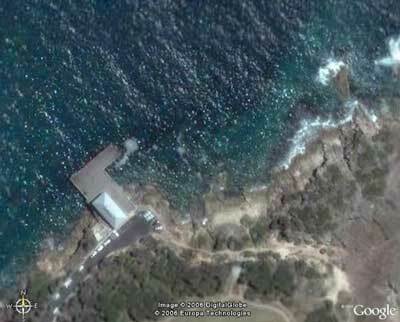 As far as I know, there are only two large wharves in NSW that are regularly dived. These are the Merimbula Wharf and the Tathra Wharf. These were built to enable the large coastal steamers to load and unload passengers and freight. As these locations (like most of NSW) do not have natural harbours, the wharves were built facing the open ocean and were quite large. 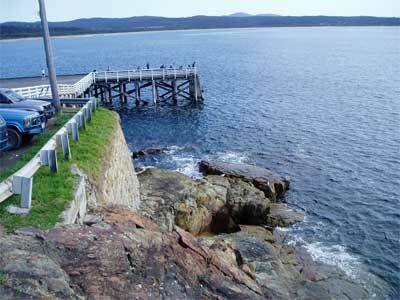 The first Tathra Wharf was built in 1862 and its replacement in 1878. The prime purpose was to bring passengers and cargo to Tathra and inland to Bega and to enable cattle and dairy products to be shipped to Sydney. The wharf was used till the mid-1900s when road transport took over from shipping on the NSW South Coast. On 17 March 1974 the then Prime Minister, Gough Whitlam, announced a grant to undertake repairs to the wharf. In October 2003 further funds were provided by the Federal Government for repairs which were due to finish in April 2004 (if in fact this work was undertaken, it was poorly done as there are a number of rotten deck planks and loose planks). This funding was provided in recognition of the historic importance of the wharves to the local area as well as to the general maritime history of NSW and Australia. The Tathra Wharf is located on the northern side of Tathra. From Sydney, it is about a 430 kilometre drive which takes at least five and a half hours drive and more like six hours. Once you arrive at Bega, follow the signs to Tathra (straight ahead in the main street rather than turning right to Merimbula). When you enter the town, turn left at the Police Station (there is a sign saying "Historic Wharf" but it is not all that obvious) into Wharf Road. Turn left past the shops (again there is a sign), this is the same road. If you have reached the pub, you have gone too far. Turn left at the pub and then right. At the end of the road you come to the Tathra Wharf. There is a restaurant and museum in the building on the wharf and there is a small parking area. Park as close to the end of the road as you can, preferably on the right side. When you get out of the car, look over the fence ahead and you will see the entry and exit point. Walk out onto the wharf and have a look at the water to see if it is clean enough to dive. Also look to see if the entry/exit point is safe to use. This site is quite affected by strong north-easterly winds and can be dangerous in winds over 10 to 15 knots. There are two parts to this dive. The best (as far as I am concerned) is out towards the point from the wharf. The other dive is in the area under and near the wharf. Take a note of how many people are fishing off the wharf as this will influence where you dive (if there are lots, you probably will not want to dive the wharf area). This is quite a hard climb down to the water's edge. You will have to step over the low wall and then climb down the rock face. There are many places where someone has put concrete to make sort of steps. Take your time and help each other and it is not too bad. Basically follow the wall down and then across to the sloping rock as shown on the bottom right of the above photograph. There is a very good rock to sit on while you don your fins. Once you are ready, flop into the water (do not do a giant stride as the water is too shallow). Swim out five metres and then descend. Once on the bottom (three metres), head to the north-west. You are in a shallow valley of clear white/pink rocks. You will gradually get deeper and after a few minutes you will reach the reef edge. The depth will be about seven to eight metres. Turn right and follow the sand edge in a northerly direction (after a few metres you will see a large yellow sponge that provides a good navigation aid for the return trip). Up until 10 minutes into the dive the bottom is not all that interesting. There is some marine life but the best is to come. At the 10 minute mark you will see a couple of large boulders which have some small overhangs on the sand side. Just past here the dive site changes dramatically. The formerly bare rocks are now covered in a multitude of marine life. The rocks are covered in sponges, sea squirts, Gabo Island soft corals, giant jelly ascidians, magnificient ascidians and literally thousands of gorgonias. The gorgonias are everywhere. Their sizes range from small hand sized specimens to ones as big as a small person. The colours range from yellow to pink to red to purple. There are more gorgonias here than I have seen in any location outside the tropics. Fantastic! The depth gets deeper as you go to a maximum of about 15 metres. There are a few more large boulders as you go, all with small overhangs and some making gullies in between. There is a lot of fishlife along the reef, large schools of yellowtail, leatherjackets of many species, friendly blue gropers, blackfish and different species of wrasse. Continue on till you have used almost half your air and then turn around and backtrack. Since you will probably be travelling a bit quicker, you will get back to the point where you met the reef edge with a fair bit of air left. If you have more than 75 bar, you could swim the short distance to the wharf and do a quick exploration before returning to the exit point. If you do not have enough air, turn just past the yellow sponge and head south-east up the "valley". Once you are back in the three metre depth, ascend and you should find yourself right off the exit point. Use the incoming wave action to get up on the rock and crawl up a few metres before removing your fins. The first person should then assist the others. It is a hard climb back up the hill (but nowhere near as heart straining as Shiprock in Sydney) and care should be taken. This is a really great dive site, one of the best shore dives I have ever done. 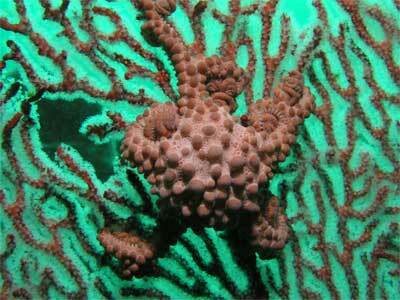 Fishlife is prolific and the fixed marine life, especially the sea squirts and gorgonias. 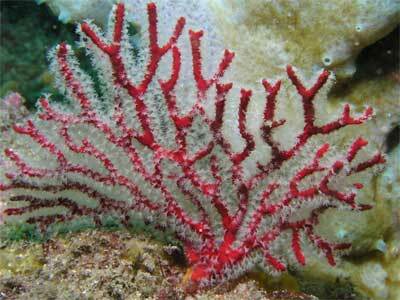 In fact, the gorgonias are the best you will see south of the Great Barrier Reef. Water temperature ranges from 12° to 20°. Visibility is said to be normally quite good.